Box scores are like movie previews; they give enough information to engage the viewer into forming his own opinion but don’t unveil all the juicy details inevitably making the formulated opinion flawed. This is especially true when quantifying an individual player’s defensive impact. Examining game film, possession by possession, is the only way to truly attach a value to an individual’s defensive prowess. This summer, Sports Illustrated college basketball writer Luke Winn spearheaded the task of rating individual defensive performances. The chore is very subjective, but, done correctly, opens an entire new world in terms of understanding the value of individual players. Winn enlisted help from David Hess, a writer for Audacity of Hoops and TeamRankings.com. This fall, Hess sent out a feeler in the Twittersphere to see if college basketball junkies would be willing to track these statistics for individual teams. 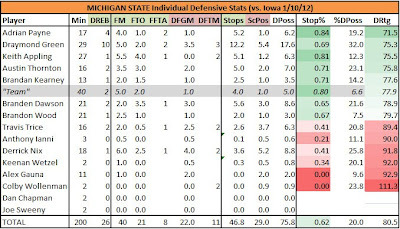 I took the bait and, along with my evening job of covering all Michigan State games for STATS, LLC., have been tracking individual defensive statistics for the Spartans’ conference games. Below are the five defensive box scores (click for a larger view) for Michigan State's first five Big Ten games. (Explanation after the first table). FM - Forced field goal Miss – when a defender forces an offensive player to miss a shot from the field. Oliver separates FM from Blocks, but I’ve lumped them together here. FTO – Forced TurnOver – when a defender forces an offensive player to turn the ball over. Again, Oliver separates out Steals, but I’ve combined them, partly because because I don’t know which plays the official scorekeeper would actually count as steals. One thing to note here is that a player who draws an offensive foul is always credited with a FTO, even if it’s just a moving screen. Stops – the credit a defensive player gets for actions that contributed to ending an opponent possession. This isn’t as simple as adding FM + FTO + 0.4*FFTA, because the credit for a missed shot has to be shared with the defensive player who rebounds it. The formula is more complex than you might think, and includes a sliding weight for FM vs. DREB, based on how difficult those actions seem to be in each particular game, so I’ll just refer you to Appendix 3 of Basketball On Paper. ScPos – Scoring Possessions allowed by a player. This is essentially just DFGM plus a FT-related factor. I’ll again refer you to Basketball On Paper for details. Stop% – [Stops/DPoss] – the fraction of an individual player’s credited defensive possessions that ended with 0 points. Essentially the inverse of offensive Floor%. %DPoss – [(Min/40)*DPoss/TeamDefensivePossessions] (for a non-OT game) - the percentage of team defensive possessions faced by an individual defender. Analogous to %Poss on offense. DRtg – [(1–%DPoss)*TeamDRtg + %DPoss*(100*TeamDefPtsPerScPoss*(1-Stop%))] – individual Defensive Rating. Gives a player credit for stops and scoring possessions he was directly involved in, then assumes a nebulous team-average performance in the other possessions. This is the analog of offensive rating. 1. Undoubtedly all the decimals in the “tracked by me” stats are puzzling you. The reason is pretty simple: defensive actions aren’t as clear cut as offensive ones. We know who scored a basket (that player gets 100% of the points) and, when applicable, who assisted on the basket (that player gets 100% of the assist). Defensive plays are much more varied. Take turnovers for instance. If a two-man trap causes a player to travel, isn’t it only fair and “right” to give each trapping player with 0.5 of a forced turnover? And, believe it or not, sometimes there are more than two players responsible for a defensive play. Hence, you’ll see occasional .25 and .33 calculations as well. 2. Official box scores aren’t 100 percent reliable, especially for the home team. This is a known fact for offensive stats as some players are given assists to boost their statistical line when, in reality, that player would only get an assist if, like hockey, two assists were given on plays. Yes, it actually happens when Player A passes to Player B who then passes to Player C for a basket. Somehow, the box score will give Player A an assist. So, just because a box score credits a player with three steals doesn’t mean he was 100 percent responsible for all those steals. That’s why there might be discrepancies in these defensive score sheets and the actual box score. 3. As noted, these numbers are extremely subjective. Luckily, changing a few plays doesn't make as much of a difference as you might think. The numbers will move, but it won't change a good defensive game to a bad one, or vice versa. 4. Defensive Rating (DRtg) is essentially the answer to the question, "If Player X were on the floor for 100 possessions, engaging in his normal rate of plays, how many points would his TEAM yield? The lower a DRtg, the better. Because defense is a team concept, a player's DRtg is largely based on team performance. So, if a player's DPoss% [the portion of plays he directly engages in] is 20.0, then 20 percent of his DRtg would be based on those plays alone, and 80 percent would be based on the team's overall defensive performance. 5. In any given game, credit/blame had to be assigned for a number of misses/baskets to the "team" as a whole, such as wide-open misses, or points scored on solo-runout fastbreaks, or putback points where one player can't be blamed for a missed boxout. All of those "team" possessions needed to be factored into DRtg, as well as the team's overall performance. DRtg should be assessed only within the context of a team, not across teams, and small variations should be viewed as significant. (For example, a player whose DRtg is much better than the tam's overall rating should considered a great defender, and the few players whose DRtg is lower than their team's should be considered liabilities. Against Indiana, it is obvious Michigan State had many great individual performances (above score sheet). Only freshman point guard Travis Trice played significant minutes and deviated noticeably from the team's DRtg. Draymond Green's numbers took a little bit of a hit by being credited with 8 1/2 baskets allowed, but that's typically what'll happen when someone is assigned to a player who, win or lose, goes off in a virtually unstoppable manner. Indiana's Christian Watford scored a game-high 26 points in the game and Green was responsible for Watford much of the night. Typically of Tom Izzo defenses on pick-and-rolls, Green really sagged, almost baiting Watford to take 3-point shots. Watford did, making enough to throw a few chinks into Green's defensive armor. ***Another smothering team effort from the Spartans. Obviously, junior center Derrick Nix dominated the paint defensively while senior forward Austin Thornton had one of his better defensive games up to this point in the season. MSU's guards all struggled, mostly because each was assigned at some point to Nebraska do-it-all point guard Bo Spencer. ***Keith Appling, known as MSU's best on-ball defender, obviously struggled against the Badgers. More specifically, he struggled when Wisconsin senior point guard Jordan Taylor (who scored a game-high 28 points) attempted to carry his team back from a large deficit. At one point, Taylor scored 12 straight points, many coming from off-balance and unguardable shots. Appling played well, but being assigned to a defensive score sheet assassin like Taylor is a nightmare. ***There are a lot of great numbers here. This, of course, is what happens in a 34-point blowout. At one point, the Hawkeyes trailed by 45 points. It wasn't until Michigan State had five scout team players on the floor that Iowa got the losing margin in the 30s. ***Michigan State picked a good time to lose as it shows exactly how a team's overall defensive performance alters every player. Keith Appling played exceptional against the Wildcats as shown by forcing three of Northwestern's six turnovers as well as forcing misses on 7 1/2 shots (more than 25 percent of Wildcat misses). Still, because the team's DRtg was 124, Appling's stellar game amounted to a 116.8 DRtg, by far his highest in conference play. This was a game that the backdoor cut absolutely killed Michigan State. I counted nine backdoor layups scored by Northwestern. Defensively, freshman swingman Branden Dawson was the biggest culprit, being burned four times. Austin Thornton was burnt twice while Brandon Wood, Adrian Payne and Derrick Nix were each caught sleeping once. 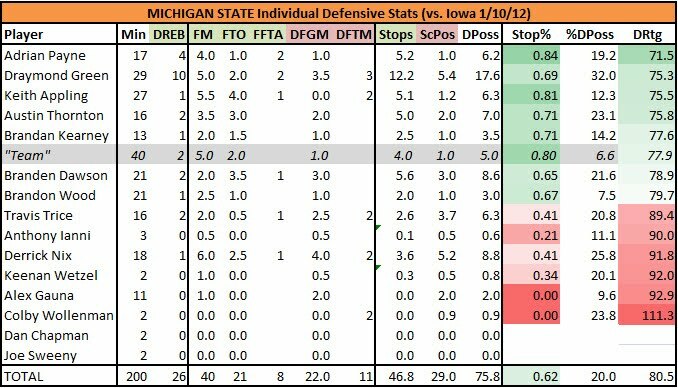 What I find most surprising is that while Nix and Payne were given much of the blame for Michigan State's defensive woes in the paint, Nix actually played fairly well. Yes, he's a little slow, but that makes it more likely he won't hedge so much. By not hedging, Nix, had he played more than 16 minutes, would have been in the paint more and likely would have disrupted Northwestern's Princeton-style offense. Nevertheless, Izzo was so fed up with Nix and Payne that, for a great stretch in the second half that he went with a small lineup with Thornton eating up minutes. The numbers suggest that wasn't a good decision by a man who is known for making great decisions daily. FINAL IMPRESSIONS: It's clear through five Big Ten games that Appling and Green are MSU's best defenders. However, don't underestimate the impact both Nix and Payne have in the middle. If those two refuse to take games off - especially on the same night - the Spartans can be one of the best defensive teams in the country. That, as we all know, could have the Spartans making late-March reservations in New Orleans for the Final Four.